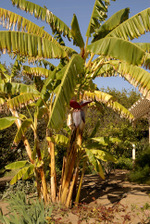 On my last trip to my dad's house in San Diego county while we still are part-owners of the house, I took a few last photos of that wonderful banana tree that Dad loved so much and transplanted when he was 96 or 97. It has fruit set again, and he won't get to enjoy it this time, since he passed away in November of last year. But it makes me happy to see that happy tree growing in the sunlight. I know it's hard to see the bananas in the shot, since they are in shadow, so I cropped it in on them. In addition to the bananas, there were the last of the ripe avocados, navel oranges, and Meyer lemons on the tree that I pruned, fertilized, and watered back to health. The Valencia orange has young fruit, and is covered with blossoms so sweet-smelling that they take your breath away when you walk out the back door. (We put a sprig in the car to carry the fragrance with us up the Valley on the drive home.) 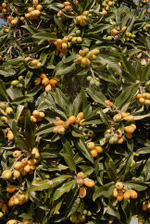 And the loquat tree was laden with fruit that was just ripening. There was even fruit setting on the little guava tree that he planted in the last decade of his life, and rescued from scale, with my help and advice, using a plastic dish scrubber and a horticultural oil spray. Well, he missed that fruit, but again, the garden is thriving and makes me happy to see. Because I have been doing some consulting for the Historic Gardens Project on Alcatraz Island, I have been to the island several times recently. I first heard that there were remnants of gardens on Alcatraz several years ago when I was working on my book Wildly Successful Plants. I learned that many of the plants I was writing about had survived from historic gardens that were planted there. Starting with a military base in the mid to late 1800s and continuing throughout the period when the island was the site of the famous federal prison, inhabitants have been gardening. What survived includes succulents, pelargoniums (geraniums), fuchsias, roses, and many more kinds of plants. These days, there is a full-time gardener on the island and teams of volunteers who work on Wednesdays and Saturdays. The gardens are starting to revive. I took this photo last week in the Officer's Row gardens. In the 1880s there were houses here, with gardens between. After these houses were demolished, in 1941, the places where they once stood became cutting gardens. Here volunteers are tending the renovated gardens while staff is observing their progress. Even the less tended areas of the island have a wild beauty. There were concrete residences on the south end of the garden, where employees of the prison lived. These were demolished, and succulents like these Aeoniums have begun to cover them, as if they were nothing but a different sort of rocky cliff. This part of the island is off limits in summer and fall, so that the island's many birds can nest undisturbed. In winter, you can wander over more of the area. Ahd this stone wall is covered with various wild and domestic plants. In summer it is abloom with Centranthus (Jupiter's beard). And, of course, the views are spectacular. Worth escaping from the big, dark cell block teeming with tourists and heading for the paths. The blackened skeletons of flower stalks of Agave americana spring up picturesquely here and there in front of ruins and the marvelous views of the surrounding bay. Here is one of the birds of Alcatraz. There are many kinds on the island, including perhaps a few more gulls than most visiting humans would prefer. But these gulls don't seem accustomed to begging for human food, probably because you can only eat in the area near the docks, so they don't get much encouragement. Looking down over the cliffs on the south and west sides of the land, you may see herons, cormorants, and other water birds. I'll be going out to Alcatraz once a month, and will report on their progress. But already, it is definitely worth a trip to see what is going on in the gardened areas. Or consider becoming a garden volunteer. You can learn more about it at www.parksconservancy.org/calendar/index.asp?event=194 by calling (415) 561-3062 or emailing cashford@gardenconservancy.org. Early in December I went to Alcatraz, the famous prison island, in the San Francisco Bay, with members of the Mediterranean Garden Society. We toured with one of the people who are renovating the historic gardens there--both the ones from the Victorian era military base and the ones from the prison era. We went places the general public can't go yet, I took digital photos with my new camera. On Monday and Tuesday of this past week, we had frost in my neighborhood. There was frost on the ground in our backyard and on all the nearby roofs. In the front, the cars had frosted windshields. At the City College demonstration garden, there was spotty frost. The chard looked untouched, as did the broccoli. The cabbage had a bit of visible frost. Among the plants covered with ice crystals were lettuce, radish, cilantro, miner's lettuce, and some of the arugula. I took photos, both film and digital. Then I went back yesterday and shot the same plants recovered. We lost maybe a leaf or two of lettuce, otherwise, everything seems fine. These winter crops are tough, but I was relieved when we didn't have a third night of frost, as that might have caused some permanent damage. Yes, stay tuned for photos! Meanwhile, Merry Christmas to all who celebrate same. Our trip to Copia, in the town of Napa, doubled as a place to give a talk on Mediterranean Food Gardening and a chance to see the place for the first time. Copia is The American Center for Wine Food and the Arts. It is quite beautiful, and the garden is at its summer peak. When I opened the car door in the parking lot, I knew we were in for a treat. The little planted islands in the parking lot are planted in grapes--perfectly manicured wine grapes with, at this time of year, large bunches of ripening purple fruit hanging low on the plants. Ever been to an Italian restaurant where the plastic grapes hung down from a trellis over the dining room? Seeing the real thing in a parking lot is startling for somehow the opposite reason that the fake ones are startling in a darkened dining room. The day (August 20th) was an Edible Gardens Festival, that included food booths, wine tastings, food demos, garden talks (including mine), crafts, children's activities, and of course, a chance to tour the gardens and the museum. Colby Eierman, the director of the gardens, took us on a personal tour of the 3 1/2 acres of edible gardens. They are all beautifully laid out in large square plots with wide lawn paths between. I envied the size and productivity of his summer crops. There were lovely tall tomatoes and peppers, and huge gourds that were hanging down from the top of an overhead trellis. Malabar spinach grew or 5 or 6 feet tall, on trellises. It is a tropical plant, very pretty and delicious too, but it won't thrive in cool weather. There were fruit trees, herb gardens, and demonstration plantings of several types of wine grapes. A children's garden includes chickens and rabbits. A problem they have is symphylans, creatures that eat plant roots. They are 3/16th inch long, white or pale brownish-pink, very thin creatures with twelve pairs of legs. I had only read about them as a pest in Oregon, but there they are in Napa. The only organic way he has found to prevent them is to plant a crop of potatoes, after which the soil is clear enought to plant another crop that would otherwise have its roots eaten up by the tiny beasts. They create the beautiful gardens with three full time gardeners, occasional seasonal help, and, yes, they do have an intern program, which you can read about on their website. I tasted papalo (Porophyllum ruderale), new to me. It is a plant with a flavor similar to cilantro, sometimes used as a substitute. 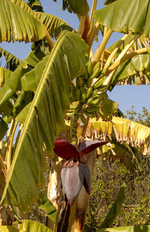 It is native to Mexico into South America and used there raw or at the end of cooking. Another plant new to me was Hoja de Santa Maria (Piper aritium), a close relative of black pepper. The large leaves of this Mexican native are used to wrap fish, then the packets are baked with a spicy tomato sauce. We watched a cooking demonstration in their arena-like indoor demo kitchen, and noticed that there is also an outdoor demo kitchen in the gardens where they can give classes. David liked the museum best. There is an exhibit on the kind of restaurant known as a diner, a permanent exhibit on various aspects of food and wine in culture and history, and other smaller exhibits. There are also a gift and book store and two restaurants. You can learn a lot more about this place at www.copia.org It is definitely worth visiting more than once if you live in the Bay Area. They have events and classes thoughout the year. It is at 500 First Street in Napa, just west of the Napa River. Regular admission is $5.00 for adults, $4.00 for seniors and students with I.D., Free for children 12 and under. It is open daily except Tuesday, 10 to 5 (except Thanksgiving, Christmas and New Year's Days and Christmas Eve). It took a little over an hour to drive there from the Golden Gate Bridge on a Sunday morning, travelling via Hwy 37, through the picturesque marshes. My back and front yards are full of flowers right now, finally. Many are among the wildly successful plants I wrote about in the book by that name. I have California poppies, which even the 7 year old neighbor girl knows are the "California flower." (A mother gave one to a toddler in a stroller as they walked by yesterday. OK with me as long as he doesn't eat it.) Then there are red and pink watsonias (in different areas), foxglove, columbine, nigella, Mexican daisy, hybrid English daisy, crown lychnis, calla lily, forget-me-not, nasturtium, and cineraria daisies in shades from blue violet through red violet, with many bicolored ones. The purple linarias are just coming into bloom, and the poor man's orchid (Impatiens balfourii) is starting to fill out. Another of my favorites is nicotiana, and I have a white one that comes back year after year, though it is supposed to be an annual. I think the less highly bred ones are more likely to naturalize than the newer hybrids. Its blossoms open most fully evening through morning, and are lovely to see at dusk or dawn. A 'Cecil Brunner' shrub rose is in full bloom, covered with its pink rosebuds that open to fully double flowers about 2 inches across. And the Rosa chinensis is starting to bloom. This is a single (five-petalled) rose that opens peach, turns pink, and then, before the petals fall, they turn light violet. The effect is several colors on one plant. My plant is two years old, and just getting going. I have seen huge shrubs of it, but my plan is to keep it in a rather confined space with careful pruning. May be a foolish plan, but I have hopes of seeing it along the back fence, but not taking over the area. So begins another season of watching the sequence of summer bloom in my garden and trying to introduce just a few more species each season. We are also enjoying the lovely warm weather of San Francisco's "May summer." (To be followed by colder June, July, and August, and then "September summer.") So we enjoy our warm days while we may. Its finally looking like spring in the gardens I keep. In my front garden, California poppies are blooming like crazy, in the back there are purple cineraria daisies; foxgloves are beginning to shoot up their elegant spires, and columbines are opening their delicate blossoms. The fava beans are over a foot tall; the peas are starting to bloom, and on Saturday, we put in bean and zucchini seeds. The damage from March's frost still appears in the occasional torn leaf or, in some cases, as reddish scars where the hail hit. There have been two major losses. I cut up and tossed a large potted Aeonioum hawarthii. It is a succulent covered with small rosettes on bare, branched stems. I saved some for propagation, but the plant was too ugly to keep. The other badly damaged plants are three dendrobium orchids I have had for many years. They have long canes with widespaced fleshy leaves and small flowers. None were in bloom, but the hail broke off leaves, damaged the ones left on the plants, and actually broke the canes. I am watching, but at best, will be cutting them up to make cuttings, and at worst may toss the entire plants. We have yet to see the full effects of the storm, but so far, the cabbage butterflies, parents of the cabbage worms, are late arriving. We searched for their eggs today on the Chinese broccoli, but there are none yet. Which pests will be delayed or fewer? Which predators will be decreased by the long rains and cold? We shall see. After we went to the fair, we hiked up a trail that led to an overlook between one part of the Civic Center Buidling and another part. This building, in case you haven't seen it, is worth the trip. Frank Lloyd Wright did it, and it is uniquely wonderful, with a clear blue roof, spires, and a futuristic feel that has endured through the decades. The garden we were hiking through zigzagged up, with a spacious circular concrete patio edged with a circular bench at each corner. It was warm and sunny, and I could imagine what a nice place each would be to have lunch while working in the building. At the top, we could look out at lovely hilly Marin from several directions and look down on parts of the building, on its blue roof and its huge skylights. The parts of the garden we walked through were nicely maintained and planted. There were redbud trees and native oaks in bloom, huge clivias in a tunnel through the building, and healthy looking nandinas along the walk. If you haven't seen this wonderful building and landscape, and are driving up 101 throgh San Rafael, look for the exit and check it out. It is on the East side of the highway, in the northern part of San Rafael. If it is a Sunday, you can go to the market too. During the week, parking might be more difficult, but then you could tour inside the building too, and see the extensive indoor plantings under the skylights.